Mr. Blaylock’s practice is almost exclusively limited to family law as it relates to business valuation, retirement plans, and tax law. He received his B.A. degree in economics in 1968 and his J.D. degree from the University of Kansas in 1971. Mr. Blaylock is admitted to practice before the United States Tax Court, in addition to the Kansas state and Federal courts. Mr. Blaylock is a frequent lecturer and author for the Kansas Bar Association, Wichita Bar Association, Washburn Law School, the Kansas Chapter of the American Academy of Matrimonial Lawyers, and other continuing legal education organizations in the areas of tax issues, pension plans (QDRO*s), spousal maintenance, valuation, and property division as these issues relate to divorce. Mr. Blaylock has lectured and written about the valuation of closely held businesses in divorce and the options available for payouts in a property division. He also authored Retirement Benefits; Tax Ramifications Reviewed and Applied in the Journal of the American Academy of Matrimonial Lawyers. Mr. Blaylock was co-author of the “Family Law” Chapter for the Kansas Bar Association Annual Survey for all the years 1989 through 2005. Mr. Blaylock co-authors the “Tax” section and “Property and Maintenance” section of the 2010 Kansas Bar Association Family Law Handbook and updates (latest being 2016). The Property and Maintenance section has been cited by the Kansas Appellate Courts as authority for some of their family law decisions. 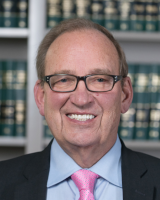 Mr. Blaylock is a past chairman of the Wichita Association Domestic Relations Committee, and a former chairman and member of the Kansas Bar Association’s Family Law Executive Committee. Mr. Blaylock has been and continues to be involved in Kansas legislative changes pertaining to divorce. He has also argued pivotal appellate cases that have reshaped Kansas divorce law. Mr. Blaylock is a member of the American Academy of Matrimonial Lawyers, past chairman of both its National Tax Committee and Alimony Committee. Mr. Blaylock sat on The American Academy’s Board of Governors from 2006 through 2008. He is listed in the Best Lawyers in America in the Domestic Law Section and has served as a reviewing editor for the American Bar Association’s Family Law Quarterly. Mr. Blaylock has and continues to be named by the Missouri and Kansas Super Lawyers Magazine as a “Super Lawyer” in the area of Family Law. While Mr. Blaylock primarily represents domestic clients in litigation, he has also successfully mediated and arbitrated complex asset divorces after the parties and their counsel have reached impasse. Mr. Blaylock has completed the courses in Matrimonial Mediation offered by the American Academy of Matrimonial Lawyers, Collaborative Family Law, and the Family Law Arbitration Training presented by the American Bar Association and he now offers those services to lawyers and clients on a selected basis. In November of 2013, the Wichita Business Journal listed Mr. Stephen J. Blaylock as Family Lawyer of the Year. Mr. Blaylock’s philosophy continues to be one that is solution driven and looks to alternative dispute resolution before court intervention. However, Mr. Blaylock has litigated, mediated, arbitrated, and settled a substantial number of complex divorces in various judicial districts in Kansas. Mr. Blaylock also handles pre and post nuptial agreements for those parties who want to fix their marital rights versus have a Court or Kansas Law determine the possible conflicts.